There's a chance I could fit a majority of our trip into one post, but to save you a little, I've decided to break it up. So here we go! A few months ago, Brandon and I decided that we needed to go on a vacation. 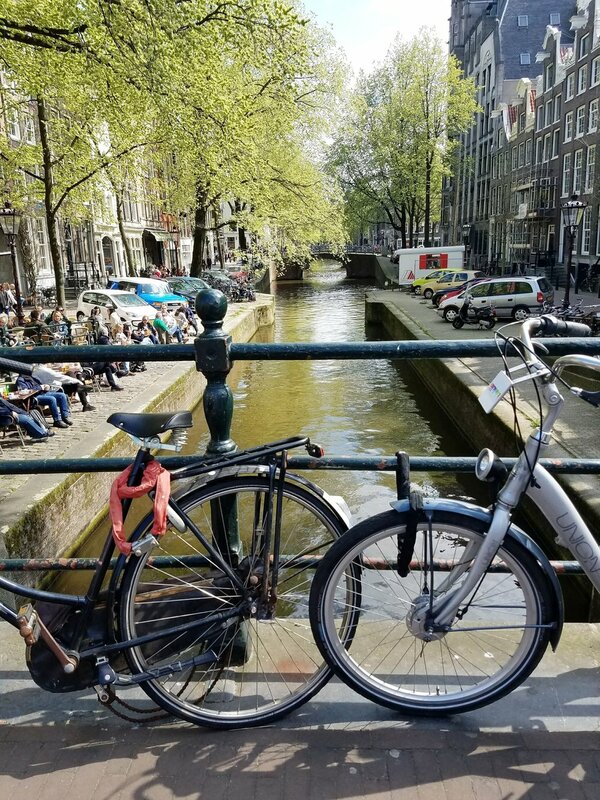 We had just been to Disneyland, but we wanted to go somewhere new over my spring break, and for some reason, Amsterdam stuck out in my head as the place to go. Fast forward a little while, and we were on our way! The Thursday before we left, we got a text that our flight had been delayed, and then Friday morning, Brandon got an email that one of our hotels had closed, and would not be refunding us due their cancellation policy. Shout out to Citi Card for disputing the charge and refunding us anyway! I thought for sure that these were signs of how the whole trip was going to be, but besides those two things, it actually went off without a hitch. Anyway! After a l o n g plane ride, we got to Amsterdam at about 11:00 am. 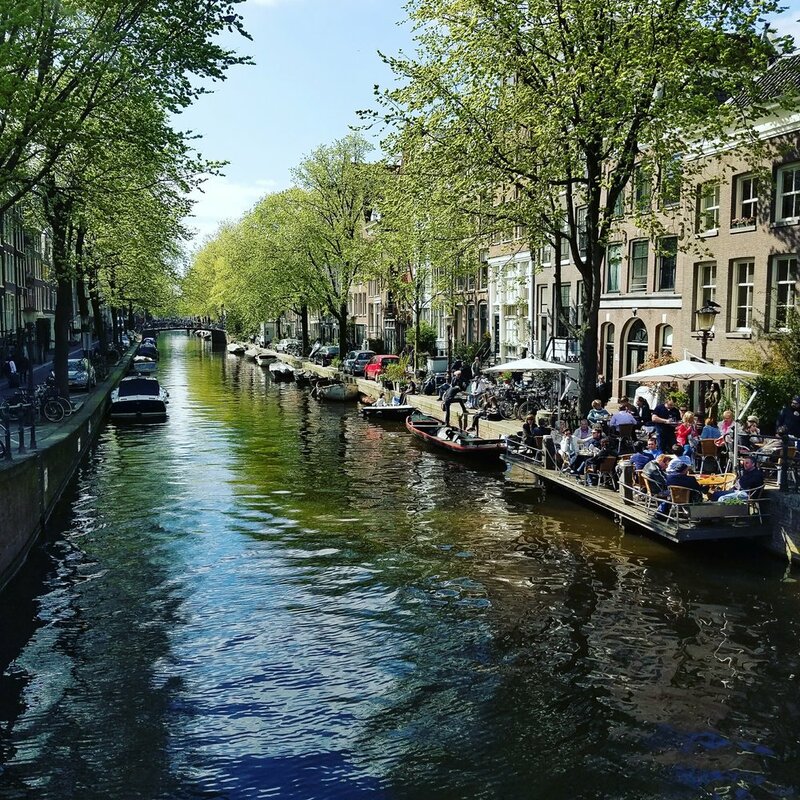 We dropped our luggage off at the hotel, then headed to the Jordaan (pronounced Yordaan) area to see the canals and find some lunch! You guys, I could not get enough of the canals. Every time we walked over one, I stopped to take a picture. I realized after about five pictures that they all basically looked the same. But I still don't care!! They are so pretty!! After lunch, we headed back to our hotel to take a short nap. Brandon and I woke up before James and Candis, so we wandered through Oosterpark for a bit. Everything was so green, and the trees were already in bloom! Once we met up with the other two, we made our way to the Anne Frank House. We hadn't purchased tickets in advance, so we had to wait in a huge line. They told us is would be an hour and a half wait, and the house closed in about two hours, so we were really hopeful that the line would move quickly and we would make it in. And we did! I'm so glad we were able to tour the house, because it really put into perspective just how little we actually know about life during the Holocaust. Sure, we can read about it, and we can visit museums and watch movies, but being in the small space where the families were confined, walking on the creaky floor that they had to silently move over...I can't even begin to imagine what their lives must have been like. The house didn't have any furniture in it, and the whole time I just kept thinking, how could they fit a bed in here? How could these parents sleep in the kitchen when there's barely any room for a table? It's so crazy. And humbling. We finished there at ten, then walked around to find food. Fun fact about Amsterdam: every restaurant not in tourist central closes their kitchen down way early. I don't remember exactly what time, but it was before we go to each of them. We wandered the streets near the Anne Frank House, in and out of restaurants, then did the same with restaurants by our hotel, only to be disappointed that most places were only serving drinks. So on our very first night in the mystical, magical land of Amsterdam, we had McDonalds for dinner. But Big Mac is the same in every language, so really, maybe it could have been worse. Terrible picture, but this is the outside of the Anne Frank House.